Thanks to guest blogger, Lisa Alzo, for this great article! Can you believe that it is almost 2015? It is now time to evaluate what we accomplished during the previous 12 months, and set new goals for the coming year. “Out with the old and in with the new.” In the Chinese New Year, 2015 is designated as the year of the Goat (also translated as "Sheep" or "Ram"). Perhaps, like me, you have a list of genealogy-related tasks you plan to work on. If you want to grab your genealogy by the horns, here are five ways to take control of your research in 2015. 1. Define your goals. List all the tasks you hope to accomplish with your genealogy research in 2015 (find elusive ancestors, break down brick walls, start writing your family history, scan your photographs, organize your digital and paper files, etc.). Next, take your list a step further and break those items you've listed down—into weekly, monthly, quarterly, annual goals—to help set benchmarks for completing them. When you track your success, you will feel a sense of accomplishment. Once you declare your goals, don’t let them stay buried in a journal, or become part of your digital clutter. Print out your list and hang it in your office where you can see the goals and focus on them each day. 2. Let go of old habits. Genealogists are often creatures of habit. We often search the same databases in the same way or get distracted by the latest technology tools or apps. Some of our habits may also be hurting our research progress (for example, not keeping a research log, letting our filing get backlogged, or neglecting to copy down a source citation for records or documents we find. This year, identify your problem areas and make a point to do better. 3. Get organized. To do your best research, you need to set yourself up for success. Perhaps you need to clean up your genealogy database, create a template for your research log, file that stack of papers, scan those photographs, or locate the materials you need to write about your ancestors. Shop for supplies (archival safe filing products—check Hollinger Metal Edge, or your local office supply store) purchase or download software or apps you need (e.g. 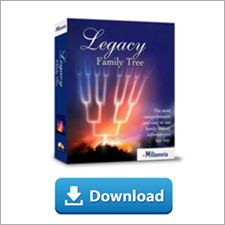 Legacy Family Tree software, Evernote, Dropbox, etc.). For help with organizing your materials, pick up a copy of the book, How to Archive Family Keepsakes by Denise May Levenick (aka The Family Curator). If scanning photographs is on your list, then another “must have” is Geoff Rasmussen’s book Digital Imaging Essentials. 4. Don’t go it alone. No genealogist is an island. As genealogists we are accustomed to working solo. Find a research partner who understands the challenges of chasing down ancestors, someone who can help you stay focused on your goals, and keep you motivated to make 2015 a great year for your genealogy. There are groups you can join too on Facebook or Google Plus. Check out the “Genealogy on Facebook” List compiled by Katherine R. Willson, to find a group that fits your interests. You don’t have to solve your brick wall problems alone when you have genea-friends who share the same passion, frustrations, and successes as you. 5. Hit the reset button. When you began your genealogy were you just a name collector? Do you question the validity of some of your data? Have you been inconsistent with source documentation? Do you practice start and stop genealogy and forget where you left off? If you find that your genealogy documentation is completely out of control, or discover major holes in your research, perhaps you need to step back, regroup and start again. If so, join professional genealogist Thomas MacEntee for the Genealogy Do-Over. There is a Facebook group (search for Genealogy Do-Over) you can join if you are planning to be a part of the Genealogy Do-Over, or if you just want to watch and track participant progress and learn new research tricks - this is the place for you to ask questions and also share advice about the Genealogy Do-Over. This is a 13-week program, broken down into specific tasks each week. The schedule of topics is posted at Geneabloggers. The list is representative and your mileage may differ . . . meaning that your research habits and specific research projects may warrant different areas of concentration in terms of skill building. Participants (and viewers) may agree or disagree with the topics or the order of the topics, so you can add or remove topics that you feel are not relevant to your specific genealogy research project. Each week, a post will appear at GeneaBloggers covering the Genealogy Do-Over topics. Posts will include tips, advice and resources. There will also be a special Legacy webinar “My Genealogy Do-Over - A Year of Learning from Research Mistakes” presented by Thomas MacEntee on Wednesday, January 21, 2015. 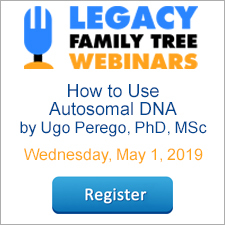 Register for this webinar at FamilyTreeWebinars.com. I am ready to make 2015 my best genealogy year ever. How about you? Have an iPad or Android mobile device? Then you'll enjoy this book and webinar from Lisa Louise Cooke. Do you have a tablet other than an iPad? No problem! Comparable apps available in Google Play are included. And the Tips and Tricks section will give you clues as to features to look for on your brand of tablet. Got an iPhone, iPod Touch, iPad, or an Android device? With the Families app from TelGen Limited you can easily transfer your Legacy Family Tree files from your PC to your iPhone, iPod Touch, iPad, or Android device, enabling them to be viewed and edited wherever you are. Any changes you make on these devices can then be synced back to your Legacy file on your PC. Learn more or purchase here. Or watch the webinar here. Evernote is the fastest-growing note-taking technology out there, so it is no wonder that it is incredibly popular with genealogists. You’ll want to keep this handy cheat sheet close at hand so that you can take advantage of all of Evernote’s powerful capabilities. Lisa Louise Cooke has designed this genealogy reference guide to be easy to use and chock full of ways to maximize your research note-taking. Windows AND Mac Editions. The subject of source lumpers vs. splitters comes up all the time on the Legacy User Group (LUG) email list. Legacy user, Wendy Howard, posted the best explanation that any of us have seen and she received several compliments on it. Rather than try to explain it myself, I asked Wendy for her permission to post her email here. Here is Wendy’s response to fellow LUG Lister, Dennis. Great job, Wendy! Okay folks, Newbie Dude here but, I'm seriously confused by all the options available regarding Master Sources and Details. Since it is possible to do in both places, is it best to attach copies of documents (or pictures) to the "Master Source" or, as part of the "Detail" (using the Source Writer), which is the best place to use to add them? Specifically, I referring to attaching copies of Birth/Death Certificates, Census Pages, etc. It depends on how you use the Master Source, whether in your particular situation it is better to attach the image to the Master Source or the Source Detail. An example... you have your great-grandmother's birth certificate. Ask yourself this question - do you set up a new Master Source for that certificate alone, or do you use a Master Source that covers all birth certificates for that country/state/county/whatever? There isn't a right answer here, only the answer that works for you. Some people will set up a new Master Source for each certificate they acquire. We call that "splitting" on this mailing list; you end up with a lot of Master Sources this way. In this situation you probably won't use the Source Detail very much, and it's appropriate to attach an image to the Master Source. Other people will set up a Master Source for all birth certificates they acquire of the same type, and then put the information specific to each item in the Source Detail. In this situation, I'd attach an image to the Source Detail, so that each citation has an image relevant to its use. We call this "lumping" on this mailing list. I tend to do a bit of both. When I first started entering sources, I set up a separate Master Source for each certificate I had. Later on, when I'd learned more and thought about what I wanted, I changed to using one Master Source for all New Zealand birth certificates, and another for all New Zealand birth registrations (a copy of the Registrar's book, we're a bit different in this country! ), and others for marriages and deaths, and repeat for England, and Scotland, and for each state in Australia from which I've acquired documents, and so on. One day I might change all those early entries and get rid of the Master Sources that cover one piece of paper alone, but then I may never get around to that. Either way, the information is still stored and can be properly interpreted by anyone reading my data. Where I've cited a book, I set up a Master Source for the book as a whole, and then in the Source Detail I put the information about which page a piece of information came from. Here, I could put an image of the book cover in the Master, and an image of a page in the Detail, if I so desired. So think about what works for you, and go with that. Keep asking questions here - the program is very flexible, and there are usually at least two ways of doing something. Which is right, depends on your preferences and expectations. The LUG email list is a great place to get your questions answered. If you would like to join the group you can sign up HERE. It is the second option, Legacy User Group. Our Legacy Family Tree Webinar Series, one of the hottest things in genealogy, just got even better. Hard to believe, especially since we just announced our amazing 2015 lineup with 58 new webinars! We are now adding the Chat Logs from our live webinars to the membership archives. We also recently added the ability for our webinar subscribers to view which upcoming webinars they have registered for. On the Upcoming Webinars page, you will see the Registered image next to each webinars where you have registered. This is also available on the page where you can register for multiple webinars at a time. FamilySearch has added more than 125.4 million indexed records and images to collections from the United States. Notable collection updates include the 124,060,301 indexed records from the Find A Grave Index collection; the 830,416 indexed records and images from the US, Michigan Obituaries, 1820–2006 collection; and the 497,490 images from the US, Washington, County Records, 1803–2010 collection. See the table below for the full list of updates. Search these diverse collections and more than 3.5 billion other records for free at FamilySearch.org.